Diary Sudan border with Ethiopia. Camped the last night in Sudan in the bush. 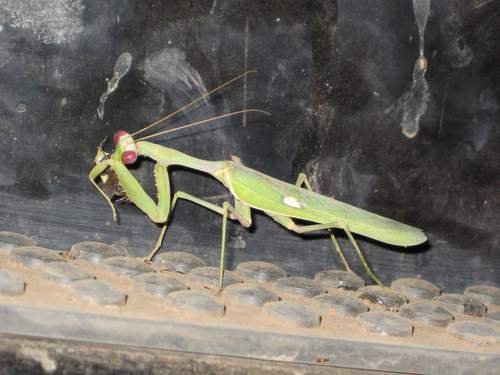 Insects attracted to light led to a huge preying Mantis turning up for his dinner. Had a very nice veg curry with rice. We chose the spot as it looked deserted, but as we left the next day we found a small village less than 300 metres away behind a small hillock. Not really a problem though as the Sudanese are friendly and welcoming. Were on the road (if you can call a rutted collection of potholes a road) by 7am and at the border town of Gallabat just after 9am. Checking out of Sudan was mercifully quick and efficient.